The phrase “hash-tag crew-love” didn’t mean anything to me before August 2012, and if you’re reading this and not part of a running crew, then it probably means nothing to you either. I’m going to attempt to define it below, and I hope that those who know what I’m talking about feel I’ve done it at least partial justice. For those who are presently uninitiated, I hope this inspires you to get initiated real quick- Run Dem Crew’s new season starts on July 9th. In August 2012 I joined Run Dem Crew, a London “collective of creative heads with a passion for running and the exchange of ideas.” You can find out all about them at www.rudemcrew.com Run Dem Crew is just one of many international running crews world-wide. There are crews in Brazil, Amsterdam, New York and Copenhagen, to name but a few. 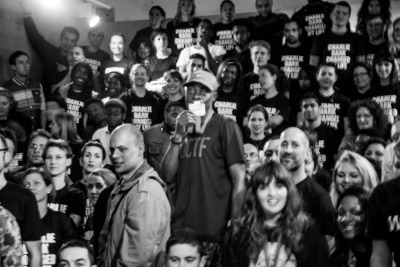 I’m going to be writing about my experience with Run Dem Crew, but from meeting people who run in crews across the world, I believe my experience is common to the running crew movement, not just Run Dem. The last time I’d run in a group was when I was in the school cross-country team, so I’m not gonna lie, I was a little nervous when I turned up for my first Run Dem Crew session. I walked through the doors of 1948, a bespoke Nike boutique in a Shoreditch backstreet which does not sell the sort of things you’ll find in Sports Direct- www.1948london.com , and was soon made to feel welcome by Charlie. As I got chatting to some other crew members, it was obvious there was a really positive atmosphere in the building and I knew I’d made a good decision. I was excited about running with other people for the first time in years. In a group there is always someone to push you, or put an arm round you. In the crew, this goes further. There’s always someone to find the right words or to high-five you, someone to talk straight and then hug you. Each Run Dem Crew session begins at about 7.15 pm with housekeeping. On my first visit, Charlie welcomed everyone to the session, and newbies were asked to say hello. Charlie then went on to talk eloquently about a crew member called Rosie, who was gravely ill in hospital. A hush fell over the room as we heard that she had been in a critical state, but now seemed to be pulling through. Charlie told us that a card was going round, and he urged us all to send messages of support to Rosie via the card, or by visiting her in hospital. I was touched by the strong sense of community, and found myself wanting to sign the card, even though I didn’t yet know Rosie. We went out for a run, and I had my first experience of running Bridges- a range of variations over the many bridges that cross the Thames. I began to notice lots of differences from my normal running experience. For example, at the end of the run, those who finish first don’t go in and get changed, they stay outside, clap the next group of runners in, and form tunnels for runners to run through by joining hands together in two columns- you can see a bit of this in the Ed Skrein video above. The basic expectation that everyone will do this is so different from the ethos that I’ve experienced and witnessed elsewhere in my running career. It creates a really positive and exciting end to your run and builds team spirit. One of my favourite features of housekeeping is medals. Each week, anyone in the crew who has run a race brings their medal in, puts it down on a table with an few accompanying words on a post-it note. Charlie reads these speeches out, calls each runner up in front of everyone, and places their medals proudly around their necks, while the crew applauds rapturously. It’s a bit like receiving a knighthood. Charlie has pointed out in the past that as adults in society generally, we very rarely take the time to congratulate each other for our achievements. He’s absolutely right to stress the importance of breaking this habit and creating a new one. Medals is often as important and enjoyable, if not more so, than the run that particular evening. There are sometimes tears, often lots of laughs and there is a real shared appreciation of the journeys that each and every one of us is on. That’s #crewlove. Charlie has kept all of the post-it note essays that have been submitted over the years of Run Dem Crew. One day, someone needs to assemble them into an artwork. There are bound to be certain recurrent themes and messages encoded in that mass of paper. Ultimately, anyone who runs long distances has pushed themselves to do something that most people couldn’t even conceive of. We’re constantly reminded of this through the eloquent words of Charlie and the crew during medals. 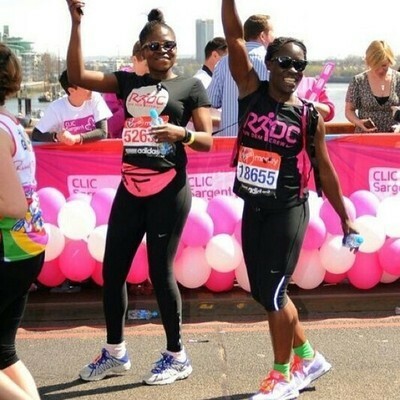 Each year, the London Marathon is one of the biggest occasions for runners all over the world. Run Dem Crew supports it’s runners by setting up a cheering station at mile 21. This is traditionally where runners hit the wall, and the impact of seeing the crew out in force cheering you on gives all the runners a real lift. Go to http://mile21.co.uk/ and scroll down to the pictures of the London Marathon cheer squad to get a taste of what I’m talking about. Charlie himself epitomises #crewlove. He spends so much of his time giving and very rarely takes time to celebrate his own achievements. He is a mentor, friend and inspiration to every one of us. He ran a significant PB at this year’s London Marathon, and the crew got together secretly to make a fuss of him. Charlie is a huge fan of the sadly deceased produced J Dilla, whose impact is celebrated on t-shirts that say “J Dilla Changed My Life”. Inspired by one of the longest-standing crew-members, Paul, we decided to secretly print up t-shirts that said “Charlie Dark Changed My Life” and put a plan into action. Unbeknownst to Charlie, we put these on underneath tracksuit tops etc and wore them to housekeeping one week. At a pre-arranged signal from Paul, we interrupted Charlie’s housekeeping and revealed the t-shirts. Literally hundreds of us were wearing them. Then some of us made speeches in honour of Charlie, thanking him for what he has done for us all. Some were funny, some were moving, but all were as memorable as the man himself. The fact that those who spoke were able to say what they did shows how much trust they have in those around them. There was not a dry eye in the house, but there was also a real sense of satisfaction that we’d been able to go some small way to repaying the love that this man has brought us all. This was my first crew race, and I won’t forget the brilliant lift I got from seeing the first crew-member cheering me on deep into the route- thank you Bangs. This continued all the way to the end and when we’d finished in the stadium, all of us immediately turned our attention to cheering on the other crew members as they crossed the line. We call it Cheer Dem Crew and the lift it gives you is ridiculous. I remember that in the East London half marathon, my mile splits were unbelievable each time I ran past Cheer Dem Crew. It’s a far cry from my prior experiences of running races alone. 6 months after joining the crew, I was in Barcelona sharing a flat with people I didn’t even know pre-Run Dem. It says a lot about the crew that I felt completely comfortable and I really enjoyed the opportunity to get to know my #teamorange friends even better over that weekend. The atmosphere in a crew is so supportive and positive that friendships are cemented quickly and because you’re constantly pushing yourself to exhaustion, there’s no sense of trying to look cool in front of new people- you all see each other at your most exposed really early on, and with that out of the way you concentrate on supporting and getting to know each other. At Run Dem Crew, although we celebrate PBs, it’s not about fast times. It’s about family. PBs may well occur, as a by-product of the growth and personal development that the crew facilitates, but the most inspiring journey in Amsterdam was that of Tahirah. She might not be one of our Elite runners, but her achievements were enormous that day and she got a standing ovation in the medal ceremony afterwards. There are so many knowledgeable people in the crew. I’m always picking up running science. I’ve become a better athlete, partly through putting down serious work in between the crew sessions, but also through constantly being pushed by those I run with every Tuesday. Tuesdays have become a psychological cornerstone of my week. A time that I know that I’m going to feel good, celebrate the achievements of others and experience growth, both as a runner and as a person. I’ve learnt to love the meditative effect of falling into step with my fellow runners as we hare beside the Thames, daring the sun to set before we reach Vauxhall, finding my place in this city in the midst of so much architectural and multicultural history, technology and movement. London- the city- my city- is a city with a vibrant heartbeat, a city that runs, a city that is always moving and that moves with you as you run. Tempo runs, twisty runs, darting through Bishopsgate backstreet runs, long, unfit, hungover runs, rueful and regretful cold winter runs. You discern the city’s heartbeat more clearly when you become it, open yourself up to it, sliding through traffic on the tail of whoever has taken on the mantle of leading your group in that moment. In January of this year, the snows fell heavy and deep. I wanted to go out and run in it, but was too scared that I’d fall and injure myself. Then some crew members organised a run starting in Mile End. I was still nervous, but in a group of 12 or 13, I didn’t let those nerves daunt me. They were doing it, so I could do it. It was one of the most magical and special runs I’ve been on. We bumped into several crew along the way, many of whom joined us for part of the run. The memories of that secret, tranquil world will last a long time. There are some maxims or sayings that are repeated like mantras at Run Dem sessions. One that struck me forcibly on my first visit was the notion that “The race is a celebration”. That completely flipped on its head everything I’d ever believed about running. I’d always seen races as painful, but Charlie argues that if you’ve done your training right, then on race day you will be able to execute your plan to perfection. It’s true that in running, you get out what you put in, and as I’ve slowly increased my running workload from 3 times a week to 4-6, I’ve gotten progressively better at what I’m doing. I really do run around half marathons with a big smile on my face, because of Charlie’s clever psychological back-flip and the confidence it gives me. Other important Run Dem mantras are “Go hard or go home”, “Leave it on the road”, “It’s not how fast you go, it’s how you cross the finish line” and, most importantly, “No one is ever left behind”. Two pictures perfectly encapsulate this last one for me. The second image shows Jeroen helping Akeem to finish the final few hundred yards of the Rotterdam Marathon. Akeem had just seized up and couldn’t have finished alone. Jeroen didn’t think twice, he just put his arm around Akeem and helped him over the finish line like a wounded soldier. That’s some Platoon love right there. Throughout writing this whole post, I’ve felt like I’m groping for words like a blind man in the dark because I’m trying to express something that is so hard to measure, explain or do justice to. I’ve tried to give the reader a number of tastes of what it is to experience #crewlove. I’m really grateful to be part of Run Dem and can only salute Charlie for getting the movement started. I try to give more than I get, but I just keep on getting and getting. That’s the way #crewlove works. It’s a paradigm shift- something that creates a new landscape of possibility. #crewlove: hash’tag-kroo’luv, n the euphoria experienced from repeatedly and unconditionally giving and receiving love and support to and from others while you are all in the act of pushing yourselves to the very limits of your being. The hashtag denotes the amplification of this experience through its being shared on multiple social media platforms, forming a kaleidoscopic collage of positive memories and shared experiences.